Eductor liquid heaters operate by condensing steam into the liquid that is being heated. The process ensures a complete transfer of the BTUs in the steam to the liquid. The steam gives up its BTUs as it condenses into the liquid. This also dilutes the motive liquid with the condensate. Eductor liquid heaters function under the normal principles of eductors. In actuality, the process is that of a liquid pumping a gas. Steam Jet Heaters utilize the principal of direct injection to mix steam with a cold liquid uniformly. Operation is efficient because the heat in the steam is absorbed by the liquid being heated to approximately 10% of liquid saturation temperature. The jet action produces agitation and circulation, eliminating the need for other equipment to accomplish these functions in most applications. 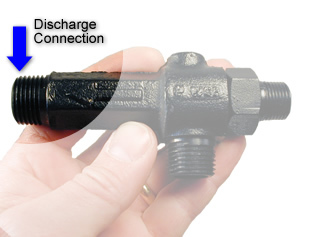 In operation, jet heaters use steam (or steam and water under pressure) as the motive force to entrain, mix with, heat, and pump (or circulate) the suction liquid. 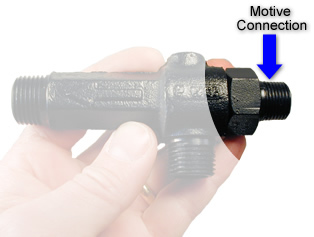 Eductor MOTIVE Connection: This connection is where the power for the eductor is generated, by increasing the velocity of the motive fluid. 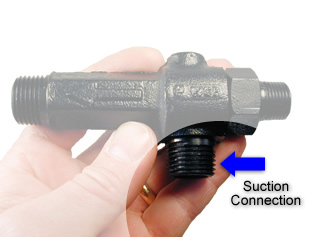 The eductor nozzle in this section takes advantage of the physical properties of the motive fluid. Eductors with liquid motives use a converging nozzle as liquids are not generally compressible. Eductors with gas motives utilize converging-diverging nozzles to achieve maximum benefit from the compressibility of the gas. All of our eductor nozzles for eductors have smooth flow paths. Flow paths with sudden steps or roughness on these high velocity surfaces cause jet pumps to operate less efficiently.